Raise Leopold Bloom from the Dead this Easter! Yes, YOU have that power within you. The everyman hero of James Joyce’s Ulysses has been unseen and unheard from since early in the morning of June 17, 1904. We are in the process of bringing out the first-ever volume of his quotable quirky quips, “The Works of Master Poldy,” this Bloomsday in a beautiful edition printed and bound in Dublin so that the world can enjoy him anew. We need your help to raise funds for “Master Poldy” and to raise Leopold Bloom from the grave this very Easter weekend. If you help us push our Indiegogo crowdfunding campaign to 2500 € (about $3200) by the time the sun sets this Sunday, we will bring Leopold Bloom to life in the Twittersphere as @MasterPoldy for all to enjoy. 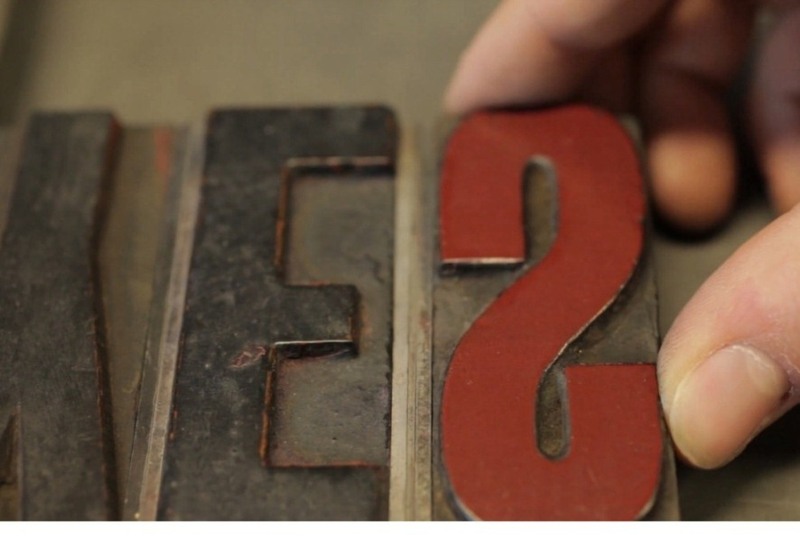 Our crowdfunding campaign with The Salvage Press to bring “The Works of Master Poldy” into the world by Bloomsday 2013 is wrapping up its first week. It’s great to see our first contributions coming in! This new book will be a great way to celebrate James Joyce’s Ulysses and Molly Bloom’s publishing vision. We still have a long way to go and we really need your help. Pitch in today with a donation and spread the word to your friends and family. This is our very first update on our very first crowdfunding campaign for the very first book we have ever attempted together. Jamie and I are itching to go on “The Works of Master Poldy” and eager to share with you our love for everything about designing and making a great & beautiful handmade book like this one. But first off we wanted to thank the 10 funders who contributed to the project in the first five days since our launch on March 22. You don’t know how encouraging it is to see such great support so early on. Thanks, thanks, thanks again! Back to the updating. We’re planning to post updates here every few days to keep you current on our progress and share with you the whole creative process. There are a LOT of steps in printing a book by hand and these updates will keep you by our side all the way. And those Perks – stickers, postcards, posters – now they are going to be fun! Jamie has started planning out the construction of the book and selecting some of the materials. The first step when designing a letterpress book is to map out all the content and to get an idea of page count. 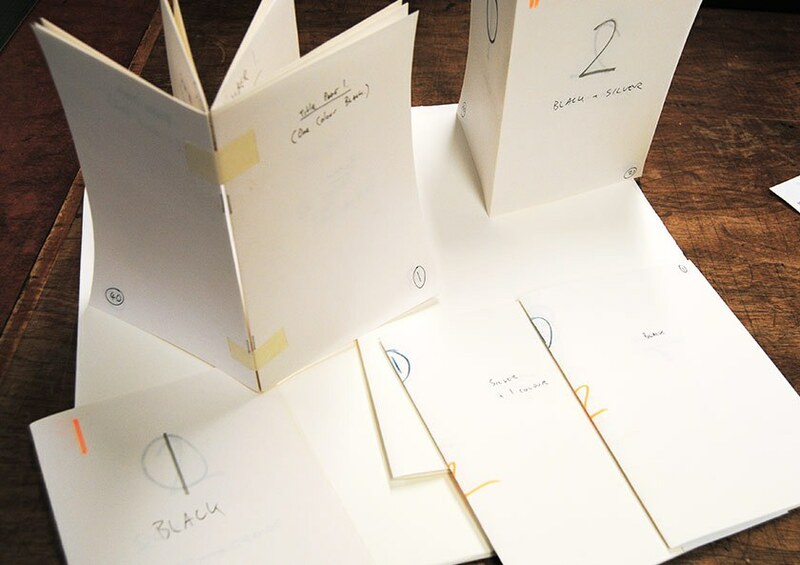 He considers himself quite traditional in his approach to this, making dozens of dummy books at a reduced size before finally choosing a direction. The photo here shows several of these dummies with pagination, possible ink choices, and the number of impressions planned for each sheet. We’re going with a book that is in two sections of 20 pages. The Zerkell mould made paper we’ll be using is heavy and crisp enough to take a beautiful impression from the type but also malleable enough that Tom the binder from Duffy Bookbinders in Dublin will have no difficulty sewing the sections together before enclosing the book in a hard case. Jamie has made a few trips to Tom’s already to talk about the binding, including the deluxe binding … but more on that later. With the construction of the book and some of the material choices made we are moving on next to the layout, design and typeface selection. There’s a very simple reason why no one has ever published a collection of Leopold Bloom’s quirky quips – they are hard to find! In writing Ulysses, James Joyce did Molly Bloom the eternal favor of wrapping her thoughts and feelings in the most conveniently consumable way possible: packed into a single chapter with absolutely no filler. And so Molly’s words are famous, staged the world around, while her husband stands a relative mute behind. Adding to that challenge is the fact that Joyce chose not to present Bloom as much of a talkers, even though at least one spectator complained that Bloom would talk your ear off about nearly anything – a piece of straw, for example. So looking for Bloomisms was not as easy as scanning the page for the dashes Joyce loved to signal a character speaking. To find most of Bloom’s words you have to delve into what runs through his mind, not what flows out of his mouth. While in Ulysses we only have one day with Bloom to catch his phrases and turns of thought, luckily Joyce rendered that day in encyclopedic detail and gems are scattered throughout the pages. Sparsely scattered. You have to pay attention to find them. And some of Bloom’s mind is expressed by others. I found great Bloomisms on the bizarro stage of the Nighttown play-within-a-novel and the cold scholastic inquisition chronicling his return home and to bed. When a phrase or passage revealed something of Bloom’s thinking in these chapters, I grabbed it and threw it in the bag along with his own words. This type of all-inclusive plucking produced a multi-hued harvest. Once I dumped the contents of that bag into a computer text file, it was clear that I didn’t have a standard Oxford compendium of Phrases Ready For Granite or (gag!) fodder for management seminars. 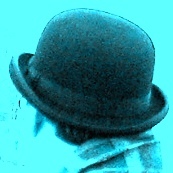 What I did have is a pastiche of one human living in a modern time, a caring and wide-awake human being, a man in full. • What: Artist & designer Jamie Murphy is undertaking a new letterpress book, “The Works of Master Poldy,” based on the musings of Leopold Bloom, James Joyce’s everyman hero of Ulysses. • Where: The book will be designed and printed at Distillers Press, National College of Art and Design, Ireland’s foremost letterpress facility. Proud to be a part of this new project! Hope you can contribute. Well, it turns out Step 1 was the easy part. Step 2, turning Molly Bloom’s vision in James Joyce’s Ulysses into reality is another matter all together. Here’s a glimpse behind the scenes of that slow, fun collaboration.